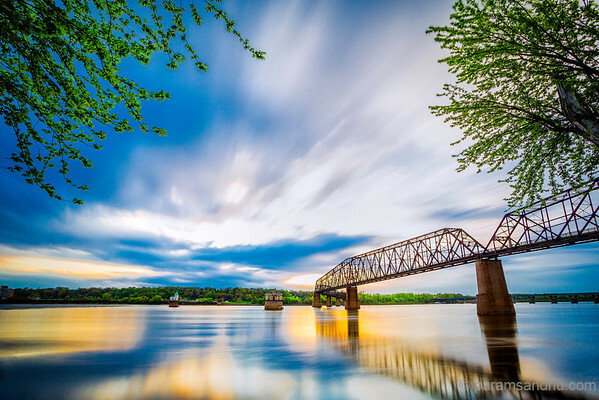 Driving down interstate 270 as one crosses the might Mississippi river its difficult not to notice the Old Chain of Rocks bridge and just beyond the old bridge two peculiar looking structures standing in middle of the river. 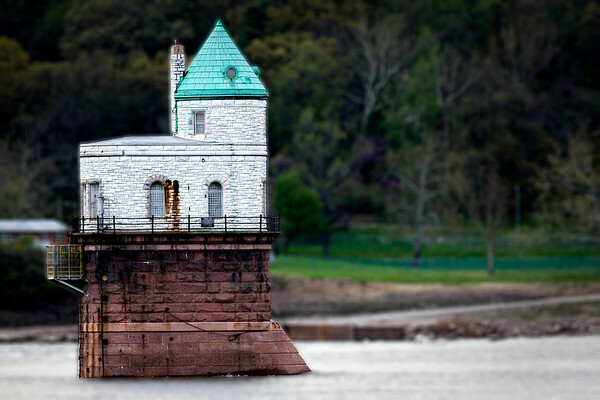 These two structures once served as the water intake towers for the Chain of Rocks Water Treatment Plant set up by the City of St. Louis to meet the water demands of its residents. The towers collected water and fed it to the onshore plant via giant pipes. 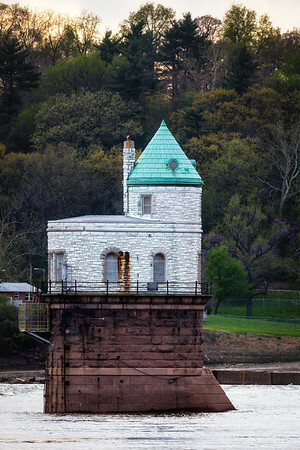 Tower #1 is the older of the two structures, built in 1894. It was designed by architect William S. Eames. Resembling a Romanesque castle in style with its distinctive green conical roof and constructed primarily with cut stone and concrete. 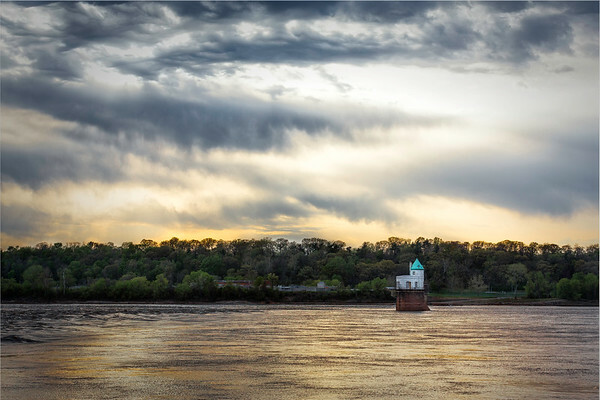 During the time of its active use workers could reach the tower via a dike from the Missouri side. A low water dam construction later raised the water level considerably thus making access to the tower much more difficult. Now only reminiscences of the dike can be seen when the water levels are low. 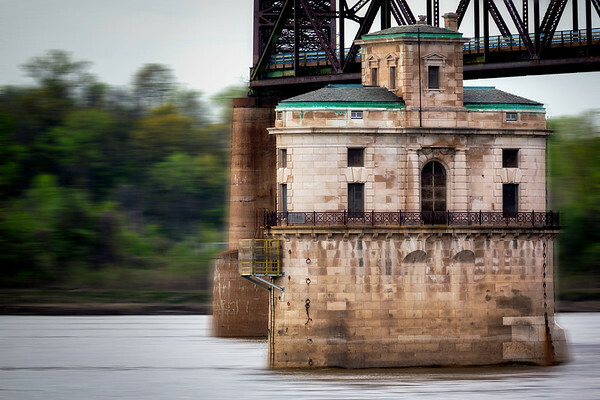 Tower #2 was constructed in 1915 to augment for the ever increasing water demands of St. Louis City. Designed by the Roth and Study firm it resembles a Roman Villa. It had living quarters for the crew who had to stay on the tower during the coldest part of winter to keep away ice from building up at the intake port. It was in use till the late 1920's. Notice the infamous bend in the bridge. 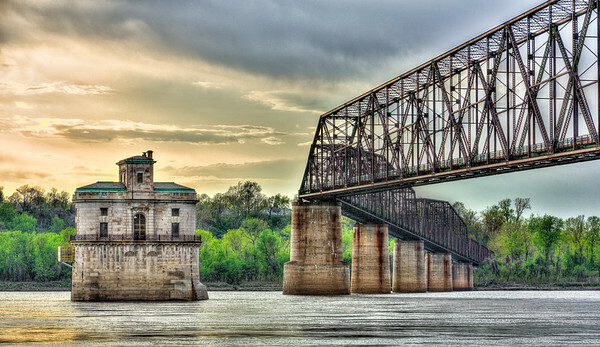 More on the Old Chain of Rocks bridge in a subsequent post. The towers remained in active use only till the 1930's being replaced by a third intake built at shore. Tower #2 is supposed to be available as a backup if ever needed.. 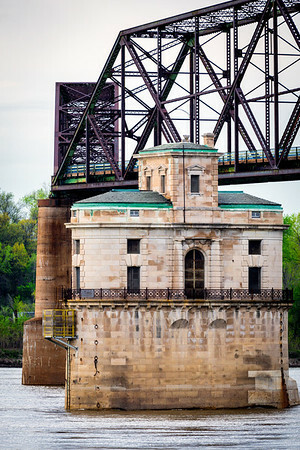 There is no public access to the towers itself but one can get a good view from the deck of the Old Chain of Rocks bridge which is open to foot and bicycle traffic or from the the river landing on the Illinois side. Google Map. Both can be accessed sunrise to sunset. Tower #1 is closer to the Missouri side but the parking on this side is notorious for car break-ins and so remains barricaded with a sign reading the aforementioned warning.